It's with a fair amount of regret that I began reading Geoff Johns's last Green Lantern volume, Green Lantern Vol. 3: The End. Though Johns had already had successes with JSA, Flash, Teen Titans, and Hawkman at the time that he took on Green Lantern, undoubtedly Green Lantern served to cement his reputation as a writer able to breathe new life into properties once thought untenable. I specifically stopped reading the post-Crisis on Infinite Earths Green Lantern series because I didn't find Hal Jordan compelling, only picking it up again when DC Comics killed off Hal for Kyle Rayner; that Johns made me a Hal Jordan fan -- that he proved that Hal Jordan must always necessarily be at the center of the Green Lantern series -- is an accomplishment indeed. Of course, ending a run of 100-plus story issues in a manner that's going to satisfy everyone is a near impossible task. The End contains just the Green Lantern issues of the "Rise of the Third Army" and "Wrath of the First Lantern" crossovers, Green Lantern #13-20; having read the "Third Army" crossover volume that also includes Green Lantern Corps and other titles, I can say that "Third Army," at least, is more epic if you read Green Lantern and Corps together. The finale of this book lacks the pop that, for instance, the Blackest Night-era Green Lantern #50 offered independently. It is rushed, at times nonsensical, and Johns does not tie up every thematic thread that I might have hoped he would. At the same time, I can agree that the thematic threads Johns does address are the book's most important ones, and if the Green Lantern conclusion can't do everything, it still for the most part does what it needs to. The "Third Army" half of this book doesn't actually involve the zombie Third Army so much as it does the inaugural adventures of Earth's newest Green Lantern, Simon Baz. On its own, I like Johns's Simon Baz story; Baz offers Hal Jordan's heroism along with the fun toughness of Guy Gardner or Sinestro. We haven't had a new Earth Green Lantern in twenty years, and it's always nice when a new Green Lantern can put the focus back on being a guy with a magic ring rather than the machinations of the Guardians of the Universe and a half-dozen other multi-colored Lanterns. But while I'm eager to see Baz's story continue in Justice League of America, his introduction feels ill-timed here at the end of Johns's Green Lantern run. There is precious little Hal Jordan in this book, with more focus on Baz and Sinestro. 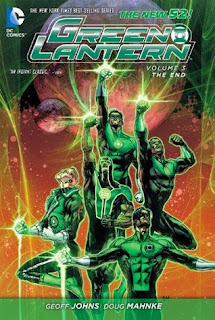 In a way the book under-serves Hal; there's plenty of talk in the book about how Hal is the greatest of the Green Lanterns, but this is never shown necessarily; there is not, as one might expect at the end of Hal Jordan's long journey of redemption, a scene of the Green Lantern Corps rallying behind Hal as they did in the years prior to the character's disgrace. Some of the book's most gripping moments are indeed Sinestro's. After years of struggle, Sinestro's home planet Korugar finally re-accepts him as their hero, only to have Korugar destroyed by the crazed First Lantern. Sinestro finally merges with Parallax, treating the reader to our first image of a Parallax-ified Sinestro. Sinestro even gets the book's best lines, as Hal finally asks him the series' long-standing unspoken question, "Were we ever truly friends?" and Sinestro replies that that's the tragedy of all of this (of the whole series, really): "We'll always be friends." Clearly Johns knows, as the reader does, that the heart of this book is (or became, somewhere midway through) Hal and Sinestro's strained friendship, and these closing lines cut to the core of what makes that friendship so compelling. Unfortunately, the Hal Jordan/Sinestro conflict effectively eclipses everything else from the conclusion. Hal and Star Sapphire Carol Ferris have come as far as almost marriage in this series, and the epilogue suggest they will be married, but alongside their growth has always been Hal's inescapable addiction to his ring. There's a strong indication in the New 52 Green Lantern Vol. 1 that Hal takes up with Carol again only because he believes he can't be Green Lantern any more. The End ties a nice bow on it, but doesn't seriously address Hal Jordan's character arc that's been a part of this series. As well, there's no specific moments with Hal and Baz (echoing, perhaps, the important Hal/Kyle handshake in Green Lantern: Rebirth, nor do Lanterns Hal, Guy, John Stewart, and Kyle Rayner have any notable interactions before the story finishes. The "Third Army" story mostly doesn't need the other books (though Green Lantern Corps helps), but the "First Lantern" chapters in this volume do suggest the reader is missing something. The story follows from issue to issue, but a lot of who the First Lantern is and why he's doing what he's doing seem to be detailed better elsewhere; also there's a subplot about a "Great Heart" that's somehow also the "First Lantern" that's hinted at here but occurs somewhere else. The final fight with the First Lantern speeds from explosion to explosion at breakneck speed. Sinestro charges in -- no, wait, Sinestro is defeated. Black Lantern Hal Jordan charges in -- nope, wait, Hal's defeated, too. Hal gets the idea, seemingly out of nowhere, to bring in Blackest Night's Nekron; while Nekron's visuals are cool, his inclusion seems "just because." Hal determines, mysteriously again, that the "emotional spectrum" must be expelled from the First Lantern's body, which Hal accomplishes ... somehow; then Nekron magically delivers the killing blow. What's moving about the conclusion -- the Hal/Sinestro bits -- comes afterward, and I might have preferred this First Lantern business had been excised entirely, "Third Army" had been Green Lantern's big hurrah, and more room could have been saved at the end for wrap-up. As it is, Hal Jordan meets his late father again -- whose death was a major factor in Johns's Green Lantern series -- and that reunion is relegated to just four very thin panels. Next week, Justice League Dark and more -- be there! Personally, I was very impressed with Johns' final issue, which sort of made me forgive the shortcomings of his last two major arcs. I really wouldn't want to be in Robert Venditti's shoes and have to follow that. Volume 2 - Green Lantern #26-52, Final Crisis: Rage of the Red Lanterns, Blackest Night #0-8 and the short stories Johns wrote for Blackest Night: Tales of the Corps #1-3. Volume 3 - Green Lantern #53-67, Green Lantern Corps #58-60, Green Lantern: Emerald Warriors #8-10, Green Lantern (The New 52) #1-20 and Annual #1. The Great Heart subplot is set up over in RED LANTERNS' portion of the crossover. Which, just my opinion, is really the worst-case scenario. Not because Red Lanterns has been the weakest of the Green Lantern titles (though it has), but because it's the farthest from the center, if you will. If something's going to factor on the Green Lantern title, I think it should be in Green Lantern Corps, with New Guardians and Red Lanterns just playing supporting roles, as was the case with "Third Army." I'm skeptical whether the "regular reader" would ever know to find their way over to Red Lanterns to understand what the Guardians are going on about with the "Great Heart." #0 is included right? And does it include the many thank yous from various writers and mass media personalities like it did in issue #20? I read the singles, but I want to double dip on this because it's the end of Johns great run. Again CE, I agree with your review. Simon Baz is likable, but there really was no reason to include a new GL at the very tail end of 9 years worth of story telling. Had Baz not been created, Johns could of spread the hectic issue 20 into 3 or 4 issues, buidling up the tension and surprises like Johns has done in Sinestro War and Blackest Night. But this felt so rushed and the First Lantern is massively underwhelming. Trust me, even if you read the entire First Lantern arc, it's repetitive and even more underwhelming. I kid you not. But, I can forgive Johns final issue because it comes at you so fast and is the ultimate ending for Hal Jordan and crew if Green Lantern every shut its door in comics. It connects good majority of loose ends (not all of them) and makes a strong emotional impact. All-in-all, it's a great book ending, but not perfect. And for doubters, Robert Vendetti and crew are doing some amazing work on GL as we speak. It's in good hands folks. Yeah, the finale reminds me a lot of THE FLASH: ROGUE WAR. While the adventure continues, it easily feels like a natural end to the entire mythology. I'm really not sure why the story is structured as an end of sorts. Can someone explain this to me? I get that this is "an end to an era" because Johns is leaving but it's not like GL is going to end, it's just continued by another writer. The End doesn't have any effects on ongoing stories. Well, yes, Green Lantern will go on, but Geoff Johns is leaving after 100+ issues and at least one major crossover and some minor ones, and he's wrapping up most of his current Green Lantern plotlines, so I think it's fair to treat this story as an "end." I would agree that perhaps "The End" is troublesome as a title if only because it might confuse the casual customer, but I do think it's fair to consider this the end of a sizable era, as you said. Geoff Johns run in writing the Green Lantern was great. Even before the New 52, his writing brought Hal Jordan back as the main Green Lantern and for me it brought excitement back to the title. But since the start of the New 52, it seemed that the spotlight shifted from Hal and focus on Sinestro. With the start of the Third Army and First Lantern, it was on the new Green Lantern Simon Baz. Though I am ok with the addition of Simon Baz as it gave something new to look for. As the story ended I like that Sinestro returned to his Yellow suit as it best suited him. And in its final issue, it was Hal who was back in the spotlight as he ended the First Lantern's reign of terror. The final issue was good/great to me as it gave the readers about the Hal's past and gave a preview to what the characters in the title are going to in the future. Also how the issue ended was good specially with that final confrontation between Hal and Sinestro.